Father Mazzuchelli’s story for children, plus coloring pages! These two articles by high school aged girls are drawn from 1899 and 1900 editions of The Young Eagle, the student magazine of Saint Clara Academy girls’ school on Sinsinawa Mound. 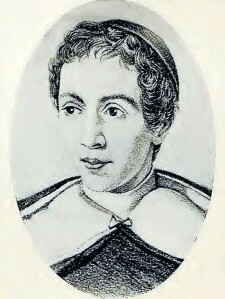 Benton, Wisconsin, several miles distant from Sinsinawa, was the original place where Father Samuel Mazzuchelli founded Saint Clara. At this time, there were still alumni and sisters living who remembered those times fondly, and even some who remembered Father Samuel himself. Father Time has many titles :—History names him for the convenient recording of her facts and fictions, as ancient and modern ; the World calls him past, present, or future, as may suit her mood, and blesses or execrates him, according to the passion that may happen to be strongest at the moment. The various notions individuals have of time, its value and its acquirements, classify humanity. To the human heart, time has many titles, glorious and otherwise, days, years, epochs—days of varied significance rounding out years of still deeper meaning—happy days, joyous days, triumphant days—and, alas, the contrasting days of sorrow and pain ! And, however long the life, it comprises, after all, merely the few flying days to which Memory attaches a value. To St. Clara’s children, there are, then, certain groups of days that stand out in bold relief on the sculptured monument of Time. Among these, there is one group of special interest and value—days of springtime freshness, sweetness, and promise; days’ marking the birth of every noble and wide-embracing faculty since exercised in glorious achievement; days of happy, holy beginnings since carried to a rich fruitfulness of accomplished wonders; days of prophetic pictures, many still adorning the wall of that House Beautiful wherein Hope dwells. In the grand, mysterious, fascinating period known as the Mediaeval Ages, two objects attract the attention of every student—its Cathedrals and its Saints. The former the faith of a people crystalized in enduring stone ; the latter that same faith, living, breathing, throbbing in the human heart. Both are temples of God. Before the first we stand in admiring awe and glory in the thought that beings like ourselves wrought the imperishable work; before the saint we kneel in humble reverence, acknowledging the infinite distance that separates our petty lives from that glorious one of self-sacrifice. The temple wrought by hands has felt the life of the ages. Its incense-laden air has throbbed to the moan of the “Miserere” as often as it has vibrated to the tones of the ” Te Deum.” Its calm-eyed sculptured saints hold the secrets of the centuries. Life, complex, many-phased, and death, solemn, majestic, have invaded its precincts. The prince and the pauper may proudly claim it as his own, but the sanctuary lamp has not always burned and hope has sometimes felt its grandeur desolate. The saint, the temple wrought by the Hand of God, stands out from any back-ground a radiant figure of charity. In his heart ever burns the fire of Love Divine, life’s truest sanctuary lamp. In the shadow of one of these temples in sunlit Milan,a clear-eyed, serious child loved to linger, absorbing into his own its spirit of silent grandeur. Was he not named for the patron saint of this, his native city ? And the wondrous kinship of sanctity knit the boy’s heart to the heart of the great Saint Charles. In the ardor of youth he entered the school of the saints, and choosing for his model the sweet-spirited Dominic, gentlest, bravest-hearted of leaders, he left all to follow the Lamb. The years that followed are the King’s secret. We may not read them. Suffice it to say, the religious became the apostle, and the apostle, when his work was over and other laborers ready, became the Founder of St. Clara, the home we love, whose history is -our heritage, whose white-robed Sisters—his children—our own guides and friends. founder of the Dominican Sisters of Sinsinawa. Archbishop Cupich NOT attending Dominican University dissident conference?